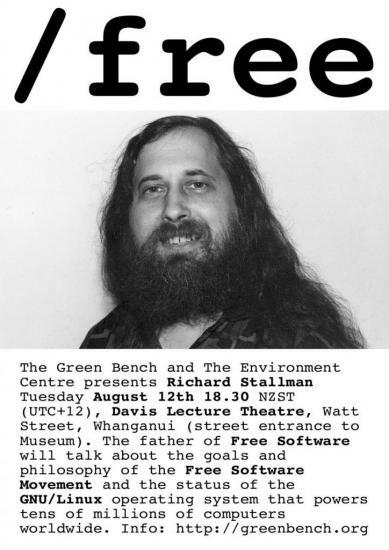 An evening with Richard Stallman. We've also asked him to speak about connections between Free Software Movement and the Environmental Movement if he has time. Richard Stallman launched the development of the GNU operating system (see www.gnu.org) in 1984. GNU is free software: everyone has the freedom to copy it and redistribute it, as well as to make changes either large or small. The GNU/Linux system, basically the GNU operating system with Linux added, is used on tens of millions of computers today. Stallman has received the ACM Grace Hopper Award, a MacArthur Foundation fellowship, the Electronic Frontier Foundation's Pioneer award, and the the Takeda Award for Social/Economic Betterment, as well as several honorary doctorates.